This season's FA Cup finalists could receive a larger ticket allocation, says the Football Association. 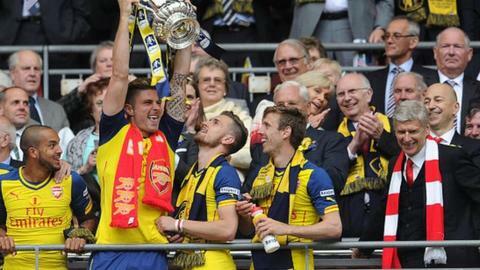 Arsenal and Aston Villa were given about 50,000, or 71%, of the available tickets for last year's Wembley final. Football Association chairman Greg Dyke wants that figure to rise, with the issue under review by the FA board. "Without pre-empting the outcome of the review, it is hoped a solution can be found that provides more tickets for competing clubs," said an FA spokesman. The allocation of tickets for the final has often caused controversy, largely because of the number that go to grassroots organisations. Arsenal complained about their allocation for the 2014 final against Hull City, arguing that "loyal supporters of the competing teams deserve a greater chance to see their team play". The current percentage matches that given to the clubs who make the Champions League final. "It is important to strike a balance between the fans of the finalists and those grassroots volunteers who richly deserve to be rewarded for their tireless efforts throughout the football season," added the spokesman. Arsenal beat Villa 4-0 in last season's final. The third round of this year's competition begins with Exeter against Liverpool, live on BBC One from 19:55 GMT. The final will be played at Wembley on Saturday, 21 May.